Indiana Jones’ return to the big screen is an incredibly fun thrill ride and a welcome addition to the summer movie lineup. Harrison Ford is back in top form and offers up equally satisfying doses of action and humor. Shia LaBeouf is also able to hold his own and keep from becoming the Jar Jar of the Indy series. The film definitely has some big problems along the way, but they are minor compared to the thrill of seeing Indy return. In 1957, Indiana Jones finds himself pulled into adventure yet again. This time instead of Nazis coming after him he’s pursued by Soviet agents led by Irina Spalko. She needs Indy to help them recover an extraordinary object stored at Area 51 in New Mexico. After your typical Jones heroics, the Soviets get away with their prize. However, Indy finds his patriotism questioned by the CIA, the FBI raiding his school office, and his job in jeopardy. Things take yet another turn for the worse when a young greaser named “Mutt” Williams shows up asking for his help. The rebellious young man informs Indy that two old friends, Professor Oxley and Mutt’s mother Marion, have been kidnapped by Soviet agents. They are tied to a plot involving a mysterious crystal skull from Mayan legend. Soon enough Indy finds himself on the way to Peru with Mutt to try and save his friends and recover the artifact. Can Indy beat the Commies and find the legendary crystal skull before it’s too late? 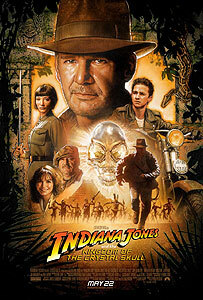 “Indiana Jones and the Kingdom of the Crystal Skull” is rated PG-13 for adventure violence and scary images. I’m going to talk about some spoilers in this review, so I recommend you bail out now if you want to avoid them. I have to confess that I’m a MAJOR Indiana Jones fan. I saw all the movies when they hit theaters. I’ve bought the toys, read the books, read all the comic books, and collected the movie posters. I’ve even introduced my kids to Indiana Jones for the first time. (My son believes Nazis are monsters that melt now. He’ll probably fail history.) So my opinion is a bit biased. but not here. Indy fans will be rejoicing along with me. The supporting cast is excellent as well. Shia LaBeouf more than holds his own with Ford as Mutt Williams. He’s cocky, rebellious, and a great sidekick for Indy. They play off of each other well. There are a lot of great possibilities for adventures with the two in the future. In fact, after the spectacular opening to the film with just Indy, my son asked, “Where’s Mutt? When is he coming?” I think kids are going to latch on to the character, and fortunately he’s not the Jar Jar of the Indy series. As already mentioned, Karen Allen has great chemistry with Ford as Marion Ravenwood. The second she appears on the screen, Indy and the audience all get big grins on their faces. Meanwhile you have Cate Blanchett as the over the top villain Irina Spalko. (It’s hinted that she’s psychic but they never seem to go anywhere with that.) John Hurt is also pretty good as Professor Oxley, but most of his time is spent acting insane. It doesn’t give him much to do. I did like Igor Jijikine as Dovchenko. He doesn’t have much to say, but he is an imposing bad guy for Indy to pummel. even in the grand finale. This is probably helped by the fact that much of the action still takes place in jungles, tombs, and ancient temples. But Lucas and Spielberg took a bit of a chance with this and it worked. but it was over-the-top in Indy tradition. And ILM did a fantastic job on the nuclear blast.) Another notable action scene involves Mutt and Indy evading Soviet agents on the Marshall campus. There’s a fantastic mix of humor and action in the scene, specifically when Indy starts a brawl between greasers and jocks in a diner for a diversion. But one of my favorite moments was short on action and long on character. It involves Indy and Marion sinking in quicksand. From Indy lecturing on the physics of quicksand to Mutt’s unconventional way of rescuing Indy to bickering with Marion, these were some of the best laughs in the movie. If you take the good, you have to take the bad as well, and even this die hard Indy fan recognizes that there is some bad stuff in this film. Topping the list are the monkeys. I used to joke that you could make any movie better by adding monkeys or explosions to it. I take back the part about the monkeys. In one scene, Mutt finds himself caught in some vines and facing a monkey. Then another. Then a group of monkeys. Then they all start swinging through the jungle together like Tarzan and Cheetah. It was incredibly stupid. Between this and the Tarzan calls from Chewbacca in the “Star Wars” movies, Lucas seriously needs to get this Tarzan thing out of his system. Then there are the visual effects. A lot of it looks fantastic like that in the final scene, the nuclear explosion, and the rocket sled. But some bits simply don’t work. For example, the CG ants, while fun, don’t hold a candle to the real live snakes, rats, or insects from the previous movies. Then there are the aforementioned CG monkeys. Or the CG heavy jungle chase. Spielberg has specifically said he wasn’t going for realism in the effects, but it works against the movie. It pulls the audience out of the experience. I’ll also mention something I didn’t expect to mention  the traps in the jungle. While this is a traditional Indy element, it seems overdone in this movie. Sadly enough, it may be because so many movies have attempted to copy Indiana Jones over the last 19 years (“Tomb Raider,” “National Treasure,” etc.). We’ve seen it done so many times that when Indy revisits it, it’s a worn out concept. I kind of contradict myself here because earlier I said this stuff made the alien elements more palatable, but Lucas and Spielberg really needed to make the traps more unique to set them apart from the copycats. Finally, I’ll mention the score by John Williams. Sadly, the only things that stood out about it were the original Raiders March and the ’50s music. There’s no other new piece of music that I can recall from the film. There’s nothing like the March from “Temple of Doom” or the Motorcycle Chase from “Last Crusade.” I’m a huge John Williams fan so it pains me to say that the score was unremarkable. If I had to rank the “Indiana Jones” movies, I’d say “Raiders” was best followed by “Last Crusade,” “Kingdom of the Crystal Skull” in a very close third, and “Temple of Doom” rounding out the four. That’s not to say that “Kingdom of the Crystal Skull” is a bad movie. I really, really enjoyed it and highly recommend it to everyone. Just temper your expectations, turn off your analytical brain, sit back, and enjoy the ride. Don’t be like “Star Wars” fans that expected “The Phantom Menace” to be the best movie evar, then were disappointed.